Valentine’s day is around the corner and I’m starting the Vday desserts early. 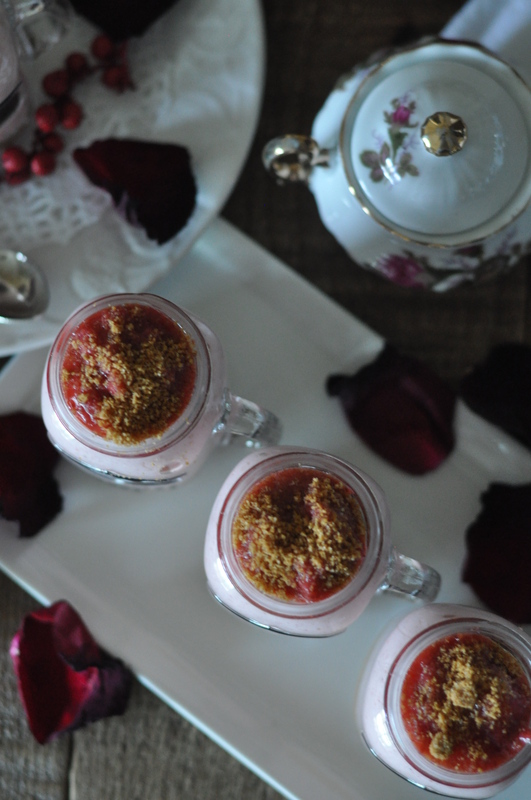 My first round of desserts for this Hallmark Holiday is a light strawberry mousse with a graham cracker crumb bottom. I adopted the mousse recipe from Miette’s baking book. 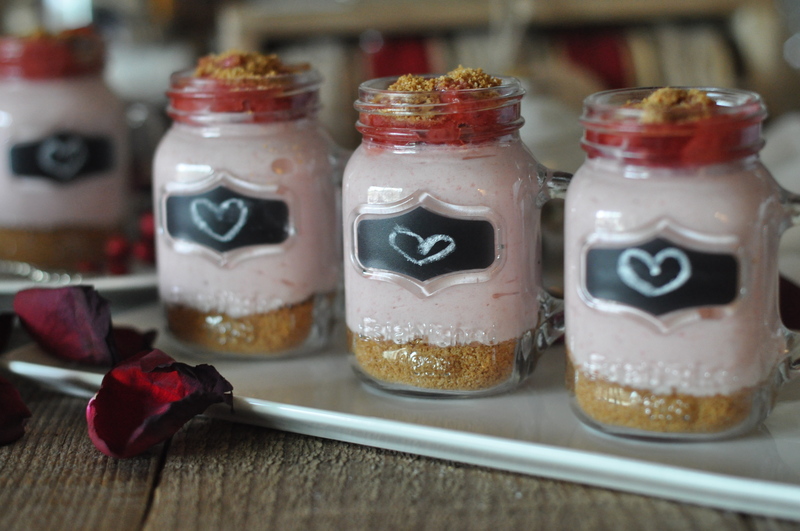 They use this mousse recipe for their Strawberry Charlotte cake, but I turned it into individual serving sizes in these adorable mini mason jars I found. It’s like taking a shot of delicious sweetness. Instead of using fresh strawberries, I grabbed a package of frozen strawberries, which worked out the same. Let me tell you, my kitchen was filled with strawberry aroma as they cooked on the stove top. 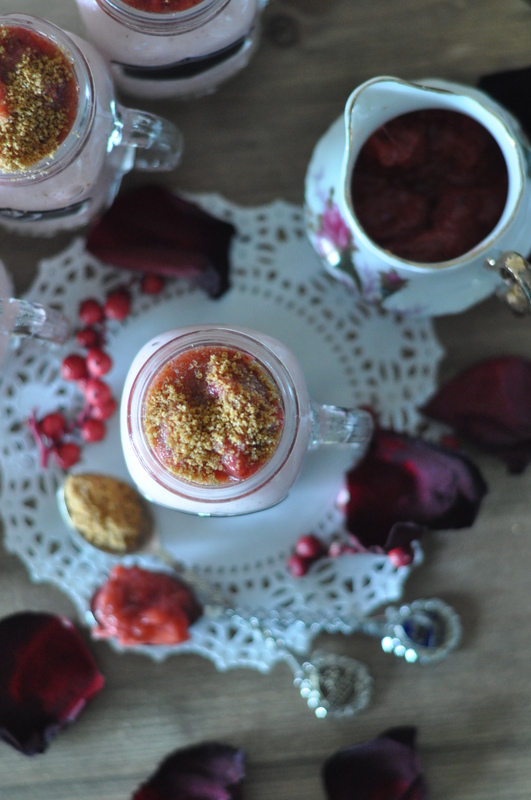 Another option is to make a layered mousse cup, alternating with the graham crumbs and mousse. I opted to put the crumbs at the bottom and top and topped them off with strawberry chunks that I reserved when straining the strawberry juice. 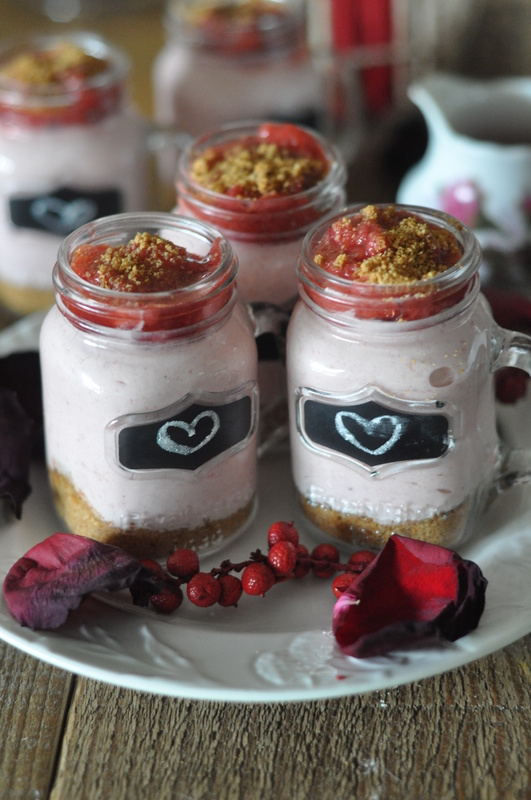 These jars of heaven are definitely cute for entertaining, and even more delicious to taste! Here’s to the beginning of February and to the countdown to Valentine’s Day! Combine crumbs, sugar, and cinnamon in a bowl. Stir to mix. Add melted butter and mix to combine. Spread crumb mixture on parchment-lined sheet pan. Bake at 320F for 8-10 minutes. Remove from oven. Set aside to cool. Combine strawberries, sugar, lemon juice, and water in a saucepan. Heat on medium heat, stirring occasionally, until the mixture becomes juicy. Strain the strawberry juice into a clean bowl. Set aside the strawberry pulp. Take about half of the juice and return it back to the saucepan. Sprinkle gelatin over the other half of the juice. Whisk to combine. Add the gelatin-juice mixture to the pan with the rest of the juice. Heat on low until gelatin dissolves, whisking slightly. Strain the juice into a clean bowl. Allow to cool completely. Whisk the heavy cream to a medium peak. Fold in the cooled strawberry juice, a little at a time until streaks are gone. To assemble: Fill bottom of jars with some of the graham cracker crumbs. Spoon or pipe strawberry mousse to fill the rest of the jar. To garnish: Top with some of the strawberry pulp and any leftover graham crumbs. Refrigerate to chill before serving.